Once you have received email invitation to join myColumbiaDoctors, click the registration link in the email to get started. This should launch the login page in your browser. Click Sign up and Connect. Then, you will be prompted to set up a new FMH account. Once you login, there are a few simple steps to complete. 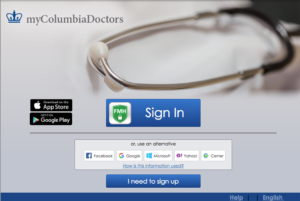 On the next screen, accept the Terms of Service for myColumbiaDoctors, powered by FollowMyHealth, by clicking I Accept. On the next screen, enter your security code, which is your date of birth in this format: MMDDYYYY. For example, if your date of birth is January 1, 1960, your code would be 01011960. (If you are registering as a proxy for a child, use his or her date of birth.) Click Next to continue. 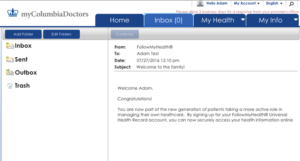 The next screen authorizes the release of your health information. When you are ready, click I Accept. You are almost done. At this point, your information is being transferred from our record systems to your myColumbiaDoctors portal account. Once your information has transferred, you are ready to explore your myColumbiaDoctors account. You will also receive an email confirming that your account was set up successfully. 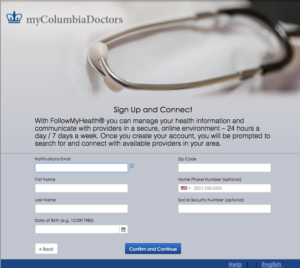 Once you have logged in to myColumbiaDoctors, you can easily update your information by clicking on the My Info tab. There are four subsections under Demographics: General, Emergency Contact, Responsible Party, and Insurance. Update any information, as needed. Remember to click the Save button. If you would like to send a general message to your provider or your provider’s office, there are two ways to do this. 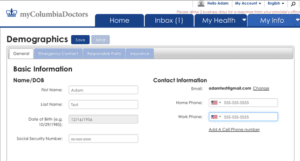 Either click on Send a Message at the top of any person screen of your myColumbiaDoctors account or go to the Inbox tab and click on Compose. Choose the provider to whom you would like to send a message, enter a subject and the message, and click Send.